We’d love your help. Let us know what’s wrong with this preview of Learn German with Paul Noble by Paul Noble. 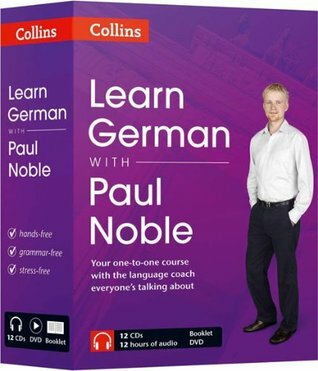 To ask other readers questions about Learn German with Paul Noble, please sign up. So far, I've been learning German, French, and Spanish (hey, don't scoff. I'm an empty-nester!) through the Paul Noble system and I completely understand why his learning system is rated highly. Paul sets you up for success by identifying the similarities between the subject language and English. For instance, by adding 'ch' onto 'I' you get the german "I"; switch the C to K then tag on an extra N and you've changed the English word 'can' to 'kann' in German. Further, we learn that most English words ending with 'ing' automatically end with 'en' in German. If Paul hadn't enumerated these, such glaring associations and similarities would be totally lost to a beginner. As a result, these associations make it easier for the brain and mind to switch languages, which means learning is infinitely less daunting. He also teaches proper sentence construction, situational conversation and more importantly, how to respond when a native speaker responds to your questions. Lastly, Paul speaks with such a mellifluous tone which instantly soothes even the most nervous beginner. Anyway, I am hoping to try my German next summer when, hopefully, I should be proficient. Ja, ich Kann! (Yes, I can). 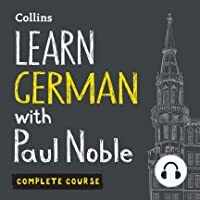 Well, I haven't tried many audiobooks for learning languages but "Learn German with Paul Noble" is definitely a good recommendation for absolute beginners of German language and better than all the other audiobooks I laid my hands on. It's quite slow paced, with sufficient pauses for the listeners to recall the answers before the phrases are actually spoken in a native German voice. And we already know this method of recalling the information is far more effective for long-term memorization than simply reviewing it repeatedly. However, since the audiobook is only 12 hours long, it's quite limited in vocabulary and pronounciation lessons sufficient only to speak basic German sentences. I'd mostly recommend it to the beginners who can't find sufficient time for learning the language actively such as from flashcards, videos or textbooks. From my personal experience, those methods are far more productive than passive learning, you'll be able to learn a lot more if you spend first 12 hours on memrise, duolingo, pronounciation videos and a good basic german book. But even for intermediate learners, it could be a good way for language immersion during commuting or personal errands' hours. Paul's method gets you talking German in a few days, which gives you a lot of confidence. The only issue is that I bought an Audible version which makes it slightly challenging to learn the German spellings, so I guess the best way is to listen to the book along with a printed copy. Great book. The methods are stress free and the lessons are incredible. I went through the audible version of this book with my A1 classes. Paul explains concepts in a way that is very helpful for the English reader. The book touches upon almost all basic principles, though do not expect it to build a huge vocab for you. Simple principles of Dativ & Akkusativ are very helpful. It cannot replace a real course, but a must add if you are seriously learning the language. Though most of the time I listened to it at almost 1.6x the speed cos things were a bit slow for I went through the audible version of this book with my A1 classes. Paul explains concepts in a way that is very helpful for the English reader. The book touches upon almost all basic principles, though do not expect it to build a huge vocab for you. Simple principles of Dativ & Akkusativ are very helpful. It cannot replace a real course, but a must add if you are seriously learning the language. Paul Noble delivers again with this course - I listened to this before heading to Germany and while I had a little bit of knowledge before, this book was excellent. Paul's way of explaining German grammar is excellent and made it easier for me to understand. He really understands the difficulties of the langauge. I couldn't recommend it enough. I highly recommend this audiobook if you are wanting to learn German. All phrases are spoken by a native speaker so you learn the correct pronunciation. He also prompts you to say them out loud with him so you are confident in speaking German by the end of the audiobook! I LOVED IT and highly recommend any language course by Paul Noble!! The course is so well designed. It teaches you how to work with and think in the language, building on what you know to deduce what you need to know. It made German cases much more comprehensible than when I learned them in college. The only fault is that it was not longer and even more complete. Super fun and engaging way to get an intro to a language! The Michel Thomas method badly executed. I cannot say enough good things about this audiobook. Normally, I am a print on the page kind of gal and would have maintained I couldn't learn as well auditorily. However, this is the perfect way to learn to speak another language. From the get-go, you feel like you are actually speaking the language, even though you may only know a phrase or two at first. Noble goes at a very slow pace and asks that listeners NOT bother to remember what they are learning. He says to let go of the memorization I cannot say enough good things about this audiobook. Normally, I am a print on the page kind of gal and would have maintained I couldn't learn as well auditorily. However, this is the perfect way to learn to speak another language. From the get-go, you feel like you are actually speaking the language, even though you may only know a phrase or two at first. Noble goes at a very slow pace and asks that listeners NOT bother to remember what they are learning. He says to let go of the memorization idea and just follow along and answer the questions when he asks things like, "So, then, how would you say, 'She would like to'?" These phrases build into sentences. Along with continual repetition, new words and grammatical arrangements are introduced. There is no pressure to remember. I believe learning happens much more readily when the learner does not feel any pressure. It's hard to get a sense of how German words will look in writing because I am only listening, but I have a German Made Simple book from the library to help me with that later. On the other hand, I think I'm getting a wonderful sense of pronunciation with the native speaker on the audio.